Let’s talk about my favorite vitamin C serum, shall we? My skin care routine has changed drastically in the past year. I’ve added a lot of active ingredients. My main concern being dry (probably dehydrated) skin, big pores, hyperpigmentation and general signs of ageing. So I gradually incorporated more and more skin care products that target specific concerns. Products with active ingredients. The ones that actually work and show results. I am still not in a perfect spot with my skin care, but my skin has improved a lot. There a couple of key products in my routine that have the most impact. One of them is definitely vitamin C serum Tetraforce C20 by Add Actives. Before you read any further. Since this product is very pricey you may be wondering if I got it for review … well, I did NOT. I ordered and paid for it with my own money. In fact I love it so much that I took the opportunity and ordered two more when it was on sale. And I will continue to purchase it. Because my skin loves it. Because it works. The results are evident very quickly (at least on my skin). And I notice that my skin looks more tired and less fresh after a week or two not using it. I was very careful with this review. I took my time. Loads of time. In fact I waited until I used up the whole bottle of this miracle worker. I wanted to write a very thorough review and wanted to make sure that my initial thoughts and feelings about Tetraforce C20 will not change and I will continue to use it. I also wanted to let you know how long does one bottle last with regular use. After a year of regular use I finally feel confident to write this review and show you some before and after photos. How did I come across with Tetraforce C20 serum? What made me buy it? Last year Saška Tomič, the creator of this very special and genius product, was searching for appropriate beauty bloggers who would want to try her new product. This magic stuff that promises a lot but is also expensive AF. I didn’t apply. Why? A part of me didn’t believe in the product. I was skeptical. Another reason was also that I just didn’t have time to bother and test yet another product. You know … I am very careful with trying skin care products. But it didn’t end there. 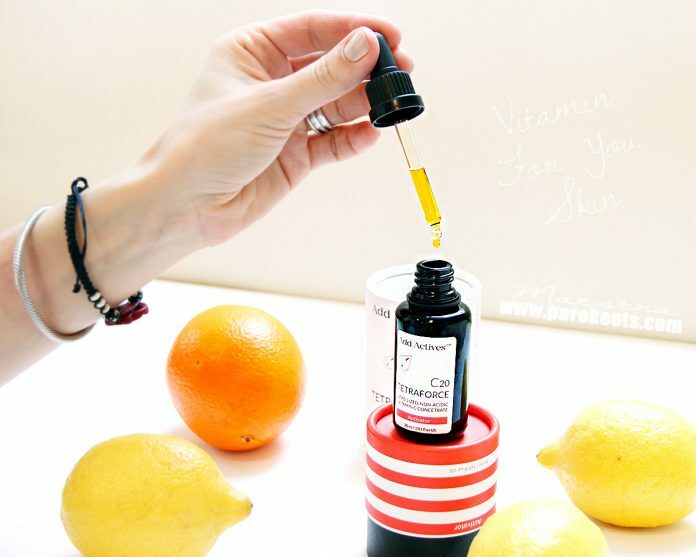 I read every single word Saška wrote, explaining how her product works, why it is effective and why it is different from all the other vitamin C serums out there. She explained that Tetraforce C20 is potent. It is very concentrated but still practically non-irritating and non-peeling. Say that again? 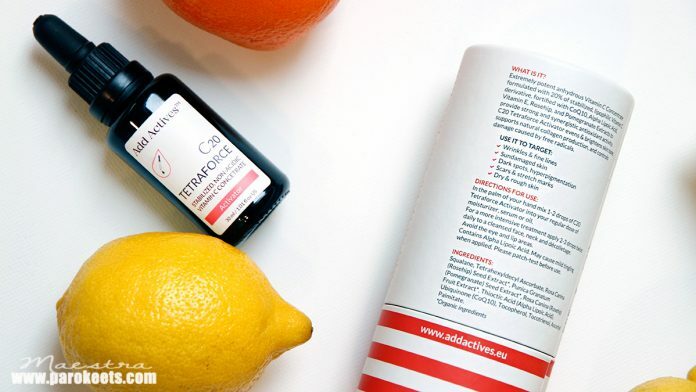 Very concentrated, non-irritating, effective and does not make you peel? Well, how does it work than? Saška answered all my questions very patiently and most importantly, she explained in a scientific but still simple way, how and why does this thing work. Man, this lady knows here stuff and has a lot of knowledge. She gradually got my respect and trust. So I ordered my first bottle of the serum and started using it on the 6th of August in 2016. And two weeks later ordered two more bottles (since it was still on sale and I wanted to stock up on the good stuff). 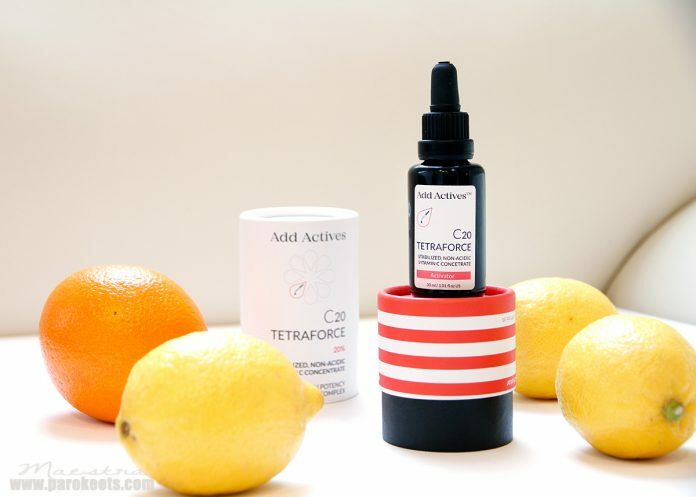 My skin and why did I buy Tetraforce C20 vitamin C serum? My skin is dry and dehydrated with very large pores, some acne scars and hyperpigmentation (due to sun exposure and spots). Otherwise my skin is thick and isn’t sensitive. My pores tend to get clogged mainly when my hormones mess with me. When it is that time of the month I have very textured skin, all my pores get clogged and I get very painful spots on my chin and one odd one on the cheek as well. My next concern is plain and simple. Ageing. Wrinkles. Fine lines. I am 35 years old. I have two small kids, one of them wakes me up 4-6 times per night. So sleepless nights are my jam. :S Add to the mix lots of stress, not enough hydration. Well, I can’t expect my skin to look nice and great, right? 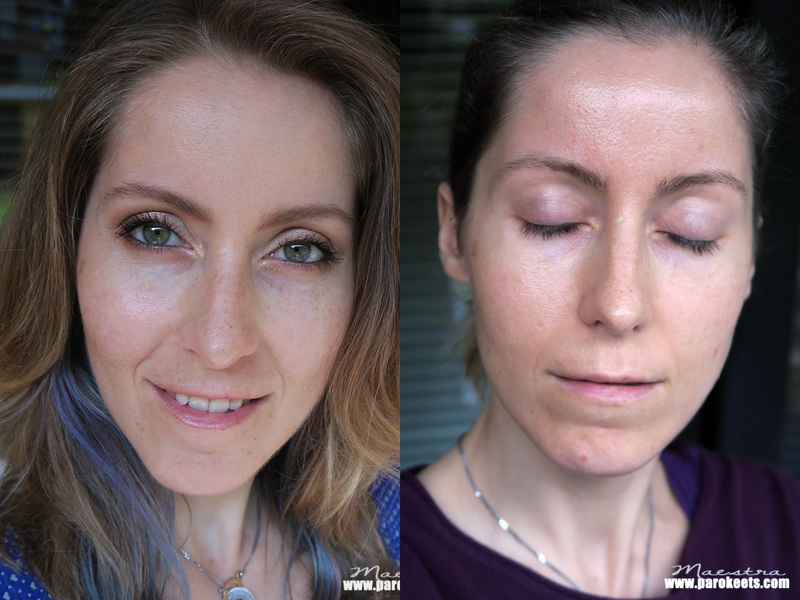 In the past couple of years my skin started to look dull, tired and I started to notice more and more fine lines/wrinkles. Short and simple, my skin need all the help it can get. This serum seemed to be the answer to a lot of my concerns. Tetraforce C20 comes in a 30 ml very high quality glass bottle. The glass is tinted very dark to protect the product from UV rays. The pipette allows for a very easy and precise dosage. 2-3 drops is enough for the entire face. It has oily consistency. The color of the product is yellow. The scent is light and nice. There is no added perfume or anything like that. How did we begin our “thing”? 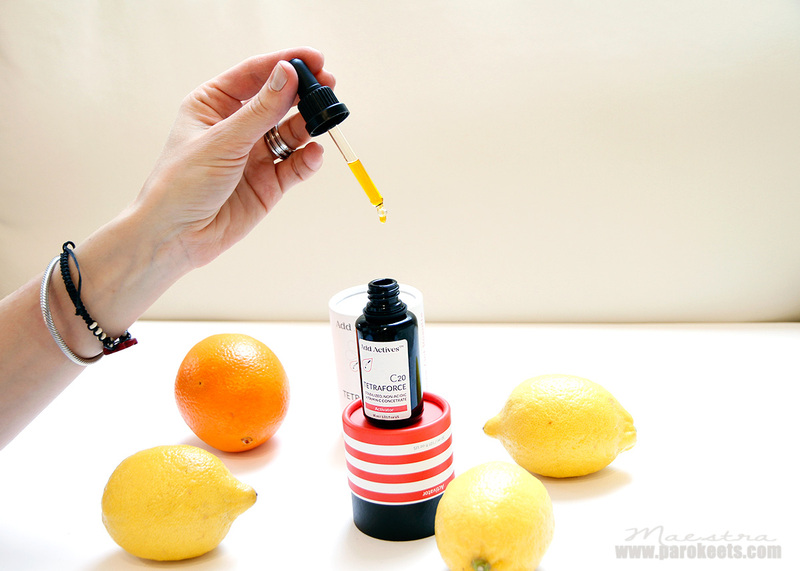 Since my skin isn’t sensitive I use from day one 2-3 drops and apply it directly to my skin. I do not mix it with other oils or creams. I started slowly and at first used it only twice a week. I never had a reaction. I never had any redness. My skin never felt sore or itchy. It didn’t break me out. And I used it during the summer months without any problems. My skin just loves this stuff. I use 3 drops for my entire face. Due to the process of how this vitamin C works it is enough to use it every other day. But I just enjoy using it so much that most of the time I use it every day (and have no problem). It depends on the day and what my skin care looks like that day. I may be using Tetraforce C20 four days in a row and than another week every other day etc. I need 3 drops for my entire face. Two drops are not enough for my dry skin. If I look slightly oily right after application, my skin drinks it up in the next ten to twenty minutes. The second I apply it I feel that something is going on with my skin. I can not tell what it is, but it is a nice feeling. Feeling of relief. Like my skin thanks me for the good stuff. It has a soothing effect on my skin. In the past year I’ve had on two or three occasions a reaction to something (I do not know what) and I got “bumpy” forehead. Tons of tiny spots. Painful and gross. My skin felt like it was angry. Some redness and tons of spots. And I couldn’t believe myself, but vitamin C serum helped me sooth the skin. Half an hour after application the redness was diminished and the skin was not sore and painful anymore. The first time this happened I thought it was just a coincidence. But not the second and the third time. I just regret that I didn’t remember to photograph the process. Maybe next time. With 3 drops per day or every other day my bottle lasted for good 6 months. After all this babbling about how much I love this product, let’s get to some photos before and after three months of use. Of course, I do not have any concealer or foundation on in neither of the photos. In the before photo the skin is definitely more uneven due to hyperpigmentation. Most of it is because of sun and not using enough SPF creams. It looks like I have freckles on my nose and cheeks. There are also some dark spots on my chin. At the time I didn’t have problems with break outs. When the after photo was taken I did have some spots on my chin and bumps all over. That’s why my skin may not look as smooth, but there are definitely less pigmentation spots. And with continued use my skin is getting more even. 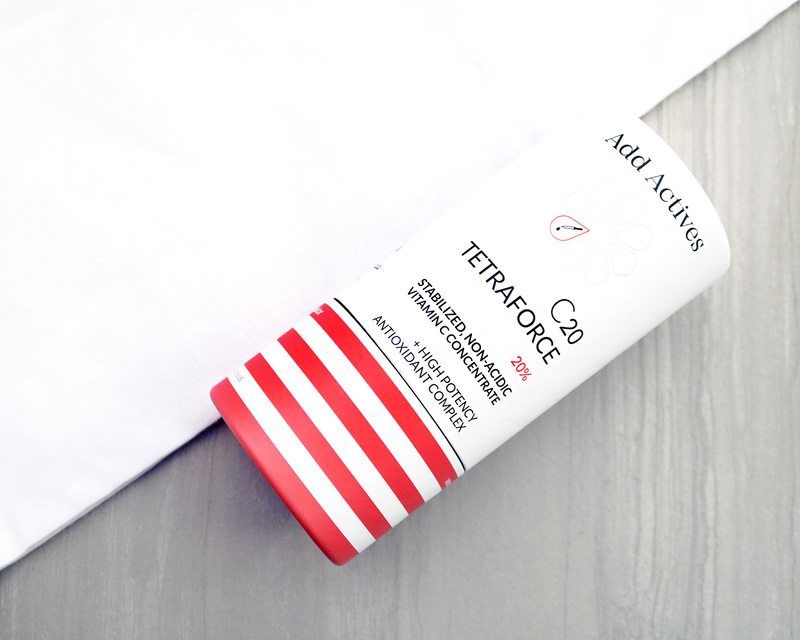 To sum up why I love Tetraforce C20 by Add Actives and is part of my everyday routine even after a year and why I take it everywhere with me. Before I started using Tetraforce C20 and after 3 months of regular use. Look at the “freckles” and spots on my nose and under my eyes. Skin is more even.